According to the Centers for Disease Control, arthritis is the most common cause of disability in the United States, limiting the activities of nearly 19 million adults. (www.cdc.gov/arthritis/) Because of its prevalence, arthritis as a disability is an important topic addressed by AgrAbility. Partnering with the Arthritis Foundation-Indiana Chapter and other organizations, the National AgrAbility Project has developed a variety of resources geared toward agricultural workers and other rural residents. Gardening is one of America's most popular hobbies and a significant food source for many. However, for those with arthritis and other other musculoskeletal conditions, like osteoporosis, common gardening tasks can be difficult or impossible. This 23-page booklet covers topics like arthritis basics, gardening pre-planning, tools and accessories, overall health, pain management, and small scale fruit and vegetable production. Contact us for information on obtaining paper copies of this and other publications. A 23-page brochure focused on agricultural workers that discusses such topics as: common types of arthritis, managing arthritis, unproven arthritis remedies, and sources of assistance. Since this publication is designed specifically for agricultural workers, it gives advice on methods of modifying farm and ranch tasks to provide added protection to joints. The publication also emphasizes proper diagnosis, exercise, medication, stress management, and working with a team of professionals to cope with arthritis. A variety of organizations are listed for those wanting further assistance with arthritis or disability-related issues. A version of Arthritis and Agriculture geared toward the Amish and other Old Order groups, this publication contains many of the major headings found in the original version, such as common types of arthritis, managing arthritis, and sources of assistance. However, because of the unique cultural and technological aspects of Old Order communities, the text and graphics have been modified to be culturally sensitive to these groups. Photos show various aspects of Old Order life, and the text includes examples that illustrate such factors as the low-tech nature of Old Order societies and their heavy reliance on animals. A health resource that reads like a comic book? It may sound strange, but the fotonovela has become a popular and effective means of communicating health information to Latino populations. This fotonovela tells the story of a farmworker family, several members of whom have incurred arthritic conditions through years of work in the fields and dairies. Important facts about arthritis are woven into the story with key points and resources summarized at the end. If you suffer from arthritis like millions of other agricultural workers across the country, you know that everyday farm and ranch tasks can put a lot of stress on your body. While there is no cure for arthritis, there are ways to manage the pain. Gaining Ground on Arthritis, a collaborative DVD project from the Breaking New Ground Resource Center and the Arthritis Foundation, Indiana Chapter, helps you understand arthritis and gives practical tips on protecting your joints, managing stress, and modifying work practices through special tools and other means. Learn about these changes today to start improving your life tomorrow. Contact us to get a copy. In fall 2007, Agricultures magazine, published by Purdue's College of Agriculture, carried an article called "Gaining Ground" about Breaking New Ground, our arthritis and agriculture initiative, and one of our clients with arthritis, Mike Williams. 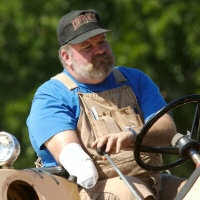 The story discusses problems faced by farmers with arthritis, assistive technology solutions, and available resources. This 39-page brochure addresses how physical activity can help relieve the symptoms of arthritis. It discusses flexibility, strengthening, and endurance exercises, describing what each type of exercise is and why it is helpful for relieving symptoms of arthritis. The publication also offers many example exercises, complete with instructions and diagrams. Also includes a list of relevant websites and other helpful resources.